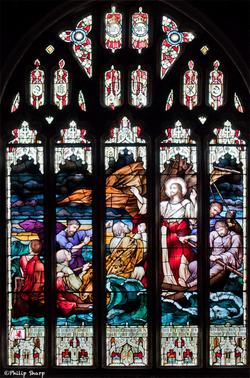 The East window in St. Martin’s Church, depicting Jesus calming the storm. Dedicated to St. Martin of Tours, a Roman soldier who cut his cloak in half to give to a beggar, St. Martin’s Church, East Looe, is predominantly a medieval building. It does have surviving vestiges of earlier Norman stonework still visible in its fabric, the most obvious of which is the doorframe surrounding the North door. Any remains of an earlier church building, that is thought to have existed on this site, have long since vanished. Inside, the building is typically 15th century in appearance, but it has obviously undergone many alterations and additions in its long history in order to accommodate different styles of worship and changing ecclesiastical fashions. 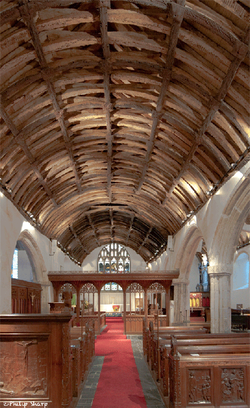 The interior of St. Martin’s Church, showing the detail of the wagon roof. Gravity has also played its part, causing the external walls to bow outwards. Maintenance and restoration have also left their mark, the most recent of which has revealed the amazing wagon roof.